At Parkway Pharmacy all we do is healthcare. Your time and convenience are very valuable to us. We will promptly fill your prescriptions and answer your questions. We specialize in personal service at reasonable prices. And, because we are locally owned, we sincerely care about our customer's health and we proudly support our community. We promise to provide you with the personalized attention you’ll seldom find at the large pharmacy chains. 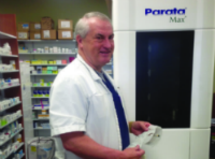 We offer the the latest in pharmacy technology to ensure the best care possible. Please stop in and discover the Parkway Pharmacy difference of personalized service and caring attention. "My pharmacy was originally started with an idea of providing uncommon customer service with the attitude that we are your healthcare servants and our goal is to work with your physician to optimize your health."